Michael Cho intended Shoplifter, his first graphic novel, as the first in a series of linked stories. It's been several years since its publication, and though Cho's career is booming (his blog includes his recent covers for Action Comics and Batwoman), I hope he will eventually return to this non-superhero project because it features such a complex but subtle use of the graphic form to express its protagonist's inner landscapes. Corinna is a frustrated, 20-something employee of a New York ad agency. The once seemingly infinite potential of her city life grows increasingly confined—a fact Cho expresses through his always regular layouts and his restricted color palette. Corinna's world consists of only three colors: white, black, and pink. While Cho employs those limitations to impressive effect—the edgeless panels allow the white of the gutters to merge with the imagery, often with striking manipulations of negative space—Corinna's life is less for it. Her relentlessly pink world is also a traditionally gendered one, as she writes ad copy for perfumes and walks in the shadows of supermodel billboards. Given the loving attention Cho gave Toronto in his 2008 Back Alleys and Urban Landscapes, it's no surprise that New York punctuates the novel with an embedded sequence of story-driving cityscapes. The only full-page and two-page images feature the city, beginning with the opening two-page strip of distant, monolithic skyscrapers blocked by a row of shorter, decorative buildings that become the window view of Corrine's advertising office. A prototype bottle of children's perfume towers front and center on the conference room table—prompting Corina's nearly career-suicidal opening comment: "How about 'Daddy says I smell special.'" Cho emphasizes the impersonality of the job by drawing the room in panels of continuous space divided by gutters that sever characters' hands as they pass the bottle around the table. The panels also frame out their heads, including Corina's—until she speaks her mind, her face suddenly centered. When the rest of the staff head off for mid-week drinks and strip clubbing, Corrine heads home: her figure lost in the two-page street-level crowd of anonymous, fellow commuters, their bodies dwarfed by headless mannequins in the panel-like store windows and the still larger and more severely cropped figures in the billboards a tier higher. Once she is aboard the commuter train, Cho's pulls back to center her train winding away from the full-page city behind it. Turn the page and Cho is a tiny window-framed figure in a black panel as she contemplates how her former hometown friends are only online strangers now: "Just a tiny picture and a status update." After bouts of shoplifting and cat whispering, Corinna is again a tiny figure in the panel-like windows of her apartment. Cho merges her computer and TV screens with the panels of the page, further boxing her into the layout of her technology-framed life. When she falls asleep drunk on her couch, her windows frame only more windows. Turn the page and the two-page spread literally heightens the effect: a street-level view of an empty basketball court and a field of black rising above it, with only a few, scattered white rectangles defining the unseen apartment building. If one of the windows is Corina's, it is both unmarked and unremarkable. She is literally and metaphorically lost in a city of blank windows. When she has to face her boss the next morning, it's before a grid of more panel-like windows, New York towering just beyond. While she contemplates whether to resign from her job, her mood lifts with the attention of a like-minded photographer. Cho begins their soul-searching conversation in an alley behind the pretentious club they're both avoiding. When Corinna leaves, she is the lone but centered figure hailing a cab in an impressionistically rippling street of car lights, the skyscrapers' white rectangles now in orderly columns rising up the full-page's black sky. The uplift is brief. The photographer is soon revealed to be another shallow womanizer trading on his artistic pretentions. Turn the page and the back of Corinna's barely discernable head is just one figure in a two-page spread of another street crowd, the headless store-front mannequins joined now by a giant bikini-ed but headless torso of a towering billboard, its neighbors featuring severely cropped women's faces, their eyes always out of frame. Corinna's moment of transformation occurs at her local convenience store where she's been stealing magazines to relieve stress. As the cityscapes suggest, she believes she's just another anonymous shopper invisible in the flow of daily customers. But this time the manager stops her, tells her he's noticed every time she's shoplifted, but also the other items she regularly buys and he regularly restocks on her behalf. "I don't know your name," he says, "but I know you." When she next appears in her boss's office, the top panel offers the same view, but with no frame, no internal window-panel. The city is literally no longer boxed in. The visual change marks Corinna's professional change: she's already quit her job. Cho offers no more full-page cityscapes, but the final pages offer street scenes, and, in a final, L-shaped panel that breaks the novel's previous layout norms, Corinna enters a stationary store to buy a composition book. She is framed only by the doorway she is opening. Cho told Comics Alliance in 2014: "Shoplifter was one of several stories that I outlined when I decided I wanted to work on longer comics. They're all separate stories, but interconnected in a particular way. There's a story about a missing girl and the impact that has on her family, another one about addiction and the different forms it takes, and one about a group of teens and their experience at a bible camp, among others." 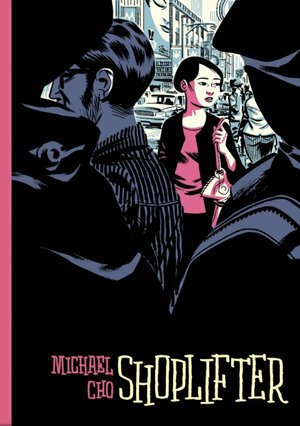 I don't know whether Cho's next installment is in the works, but given the deftness of his graphic storytelling in Shoplifter, I hope this concise, 84-page novella is just the first chapter of a sprawling, multi-story opus.